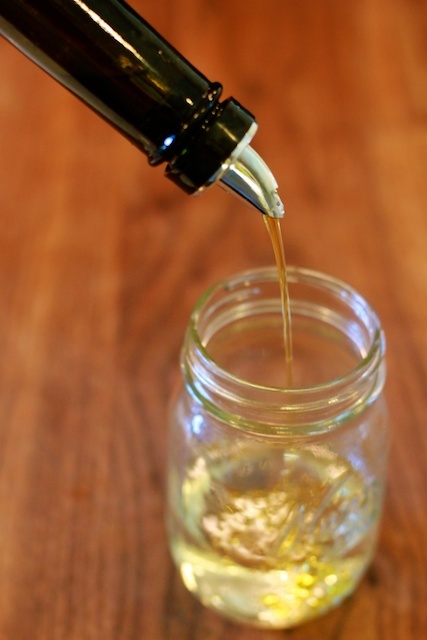 This recipe holds a special place in my heart, as it was one of the first that I added to my arsenal about 10 years ago when my husband and I bought our first house as wee twenty-somethings. Along with the house came a quaint little kitchen (imagine that!) complete with an original 1950’s white enamel stove. At any one time we’d have at least a friend or ten crashing on the couch, which meant that it was time for mama bird to learn how to cook. I bought a vintage apron and a subscription to Martha Stewart and began setting off the fire alarm around 6pm each night. For some reason I don’t remember but am forever grateful for we threw a party one weekend, and our buddy Steve decided to call his mom up north and ask for her spinach salad recipe so he could share it with me, salad girl. It’s no big secret I love a good salad. Naturally, I was overjoyed at the thought of a recipe that wouldn’t set anything on fire. Then once I tasted it, well, the rest was history. 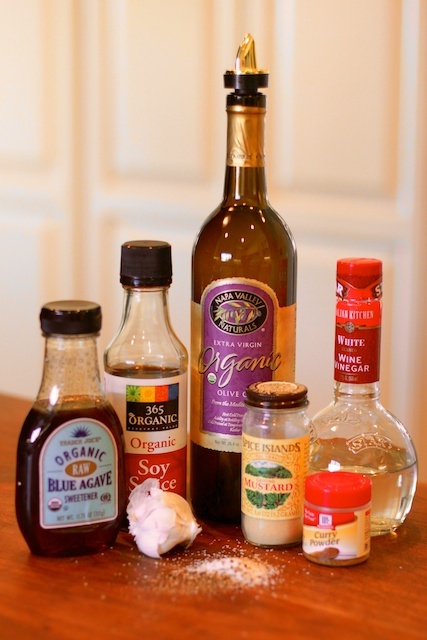 Over the years I have adapted the toppings based on what was in season or in my fridge, and I have done the same with the dressing based on the ingredients I personally tend to stock in my pantry. I hope you’ll print this one out and, over the years, do the same. Just be sure to give the ultimate credit to Steve and his mom. Kathy is a saint, and a wonderful cook. She also grows the best tomatoes I’ve ever tasted in my life and gives good hugs. I hope to be that great someday. And now, spinach salad, Steve style. 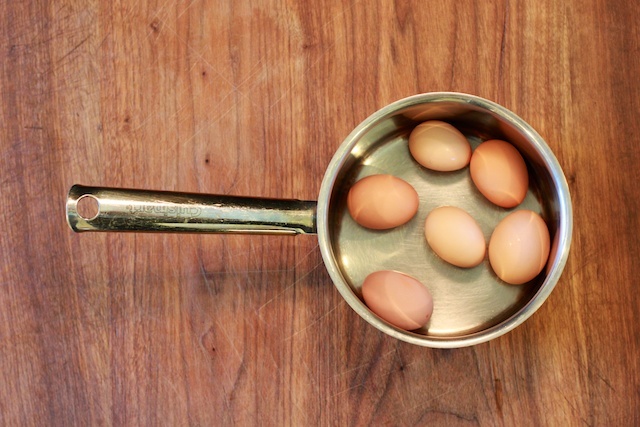 Let’s begin with a little lesson in hard boiling eggs, shall we? In my opinion it’s not always as easy as it looks. Try it out and let me know if you have a better way! 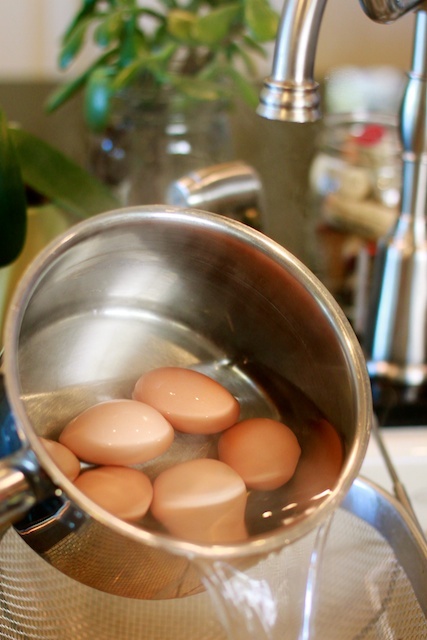 I always start by placing 4-6 eggs in a saucepan. These eggs are courtesy of our little ladies out in the backyard coop. Fresh eggs are maybe the best thing in the whole world. 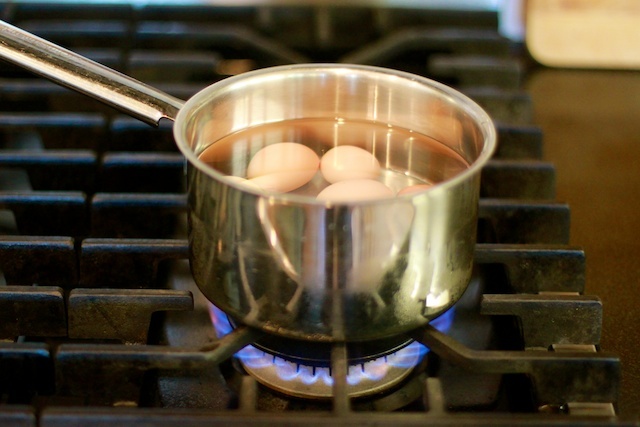 Unless, of course, you are planning to hard boil them. Intrigued? Good, keep reading! 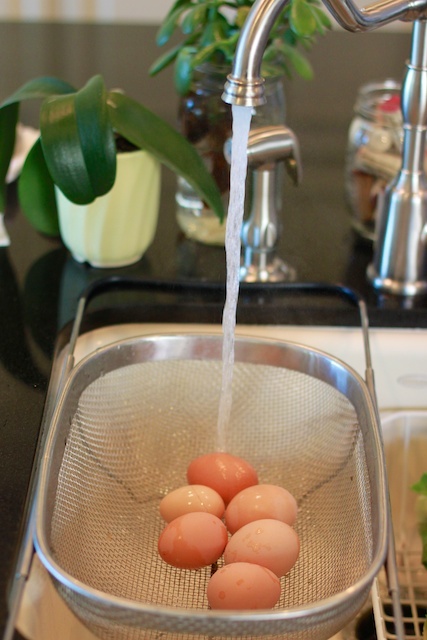 Cover the eggs with cool water by one inch. Then place on the stove over medium heat. Because you are trying to boil water, I know that your inclination, like mine, will be to turn the heat up full throttle. Don’t. That’s how you crack and egg, as I’ve learned (or failed to learn?) from years of experience. 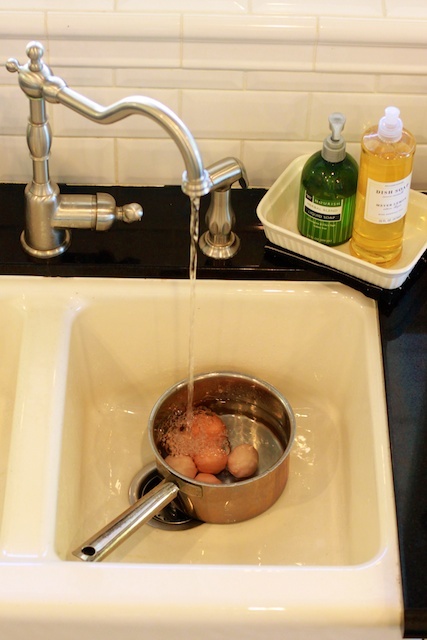 Another important detail that is totally contrary to your water boiling intuition – do not cover the pot while bringing the water to temp. Weird, right? I know. Nonsensical. And now for the magic. 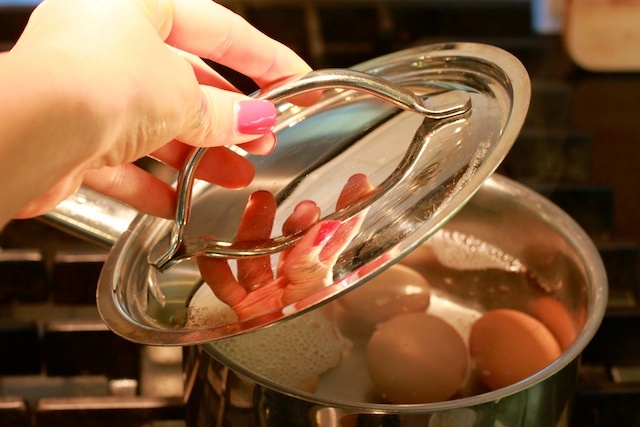 Only after the water has come to a boil will you turn the heat completely off, and then, only then cover the pot with a lid for 12 minutes. Be sure to set a timer or you’ll end up burning the house down. With no flame on. Don’t put it past me, it’s totally something I’d do. 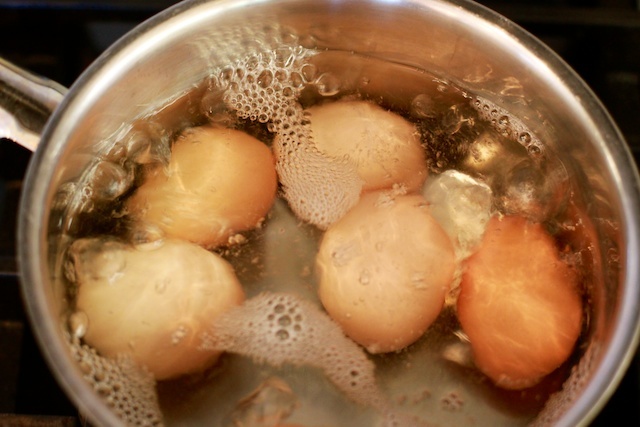 After 12 minutes drain the water and cool your little egg babies down. If you don’t run them under cold water or dunk them in an ice bath they’ll just keep right on cooking, so be warned. Follow my steps exactly or behold the disappointment of chalky egg yolk, yo! So remember how I said it ‘aint easy to hard boil and egg? 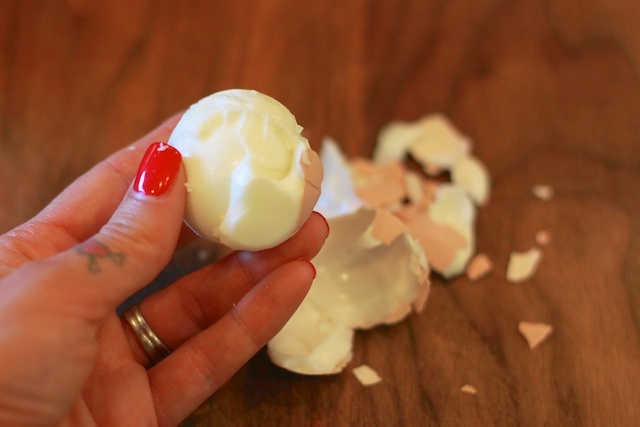 Maybe what I meant was it ‘aint easy to peel a hard boiled egg. Do you also remember how I said these eggs were laid by our chickens? 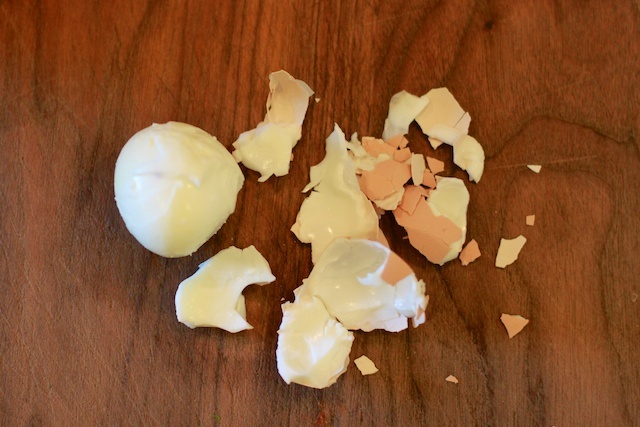 I’ve heard that the fresher an egg is, the harder it can be to peel. I can now confirm this as fact. 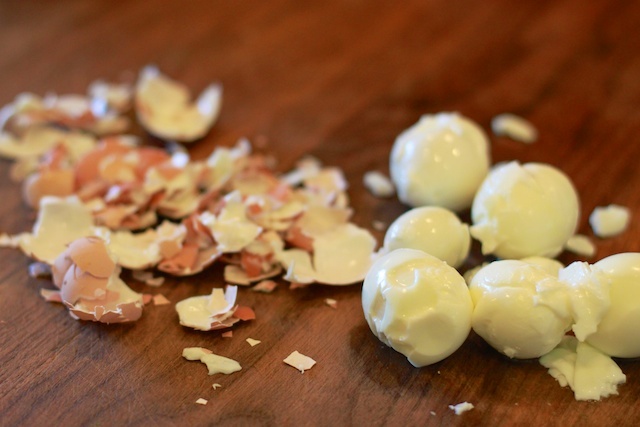 Day old chicken eggs are really freaking hard to peel. Next time I’ll let them sit in the fridge for a week, darn it. Despite the fact that my eggs are so not appropriate for deviling or any kind of intact presentation, they still look delicious when they’re all chopped up! 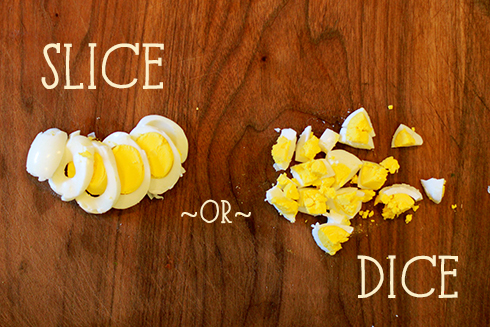 Slice ’em or dice ’em, it’s totally up to you. 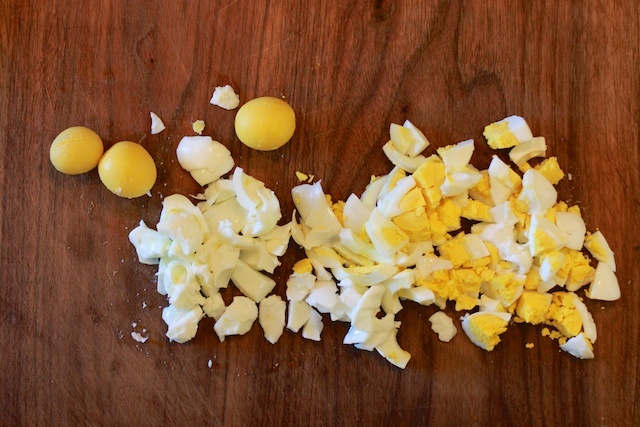 I personally prefer the dice for this particular recipe because the crumbly egg yolk mixes a bit with the salad dressing and becomes heavenly. It surely has nothing to do with any need to mask my pathetic shell peeling moment. Promise. This pic is here to remind me to tell you that out of the 6 eggs I boiled I used all 6 egg whites, but only 3 of the yolks in the salad. Can’t say why, that’s just how I’ve always done it. Now for the onions. 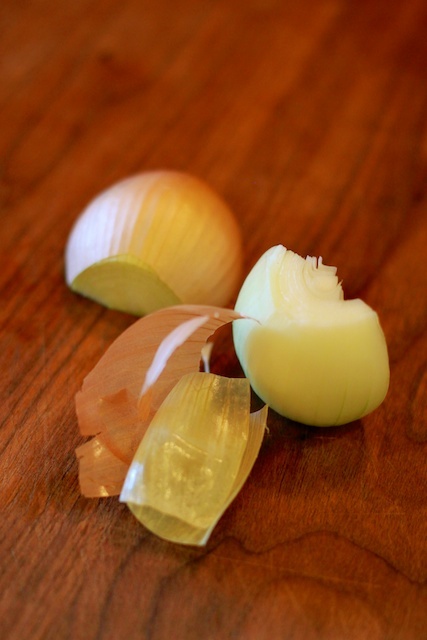 Chop off the ends, slice the onion in half, then peel. When I put onions in a salad I like them super duper thinly sliced. 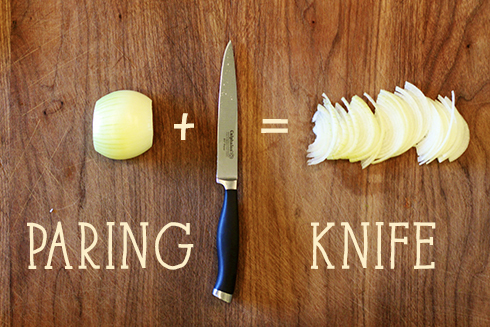 The best way to achieve this is with a smooth edge paring knife, or a larger chef’s knife. 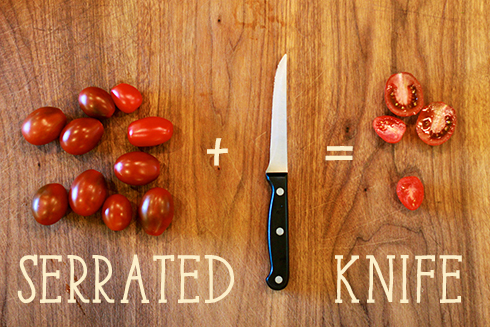 Conversely, when cutting something soft fleshed like a tomato, I find that a serrated knife works best. This is partially because many of my smooth edge knives need sharpening. It’s my husband’s job, and I’m sure after he reads this post my knives will be razor sharp once again. Uhem. Uhem. Love ya’ babe. 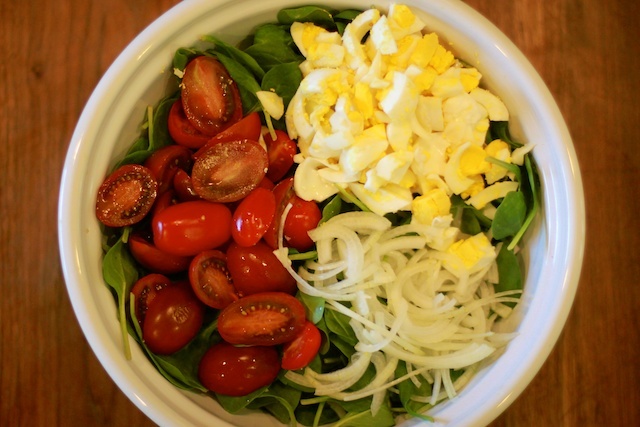 Throw your spinach in a bowl and top with your fave ingredients. Gorgeous, am I right? Now, I made this salad with what I had in the house. Truth be told, there is one very important ingredient missing, according to all of the men I’ve ever served this salad to. Can you guess it? Can ‘ya? Nope, not beer. Uh uh. Not football either. That’s right, I’m talking about bacon! Sizzling, crunchy, yummy bacon. Turkey bacon is what I use these days, but 10 years ago it was the real deal. Bacon or bust. 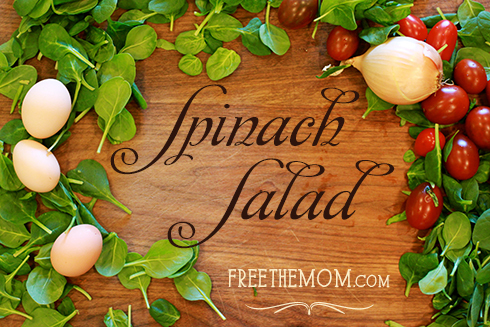 As I wrote in the ingredient list above, there are endless combinations that taste great with this salad. One of my faves to add to the hard boiled egg and bacon combo is sautéed red onion & mushrooms. 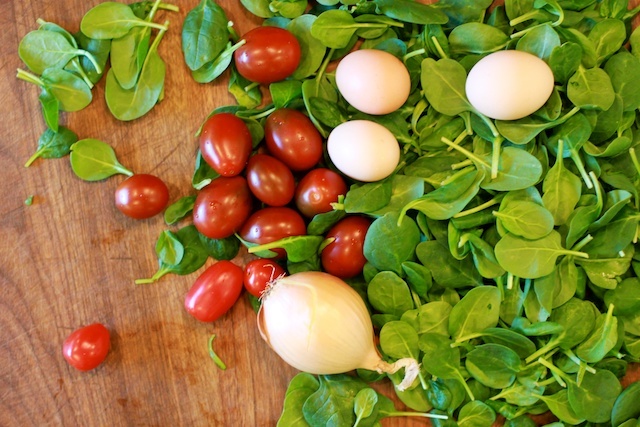 The heat from the warm ingredients wilts the spinach just a little and is crazy wild yummy. A good summer combo is mandarin oranges, strawberries, & pecans. But truly, whatever you have in the house is just perfect. And now for the dressing! This one packs a punch with the addition of curry powder and dry mustard. Yowza. The close up, in case you’re a brand whore. 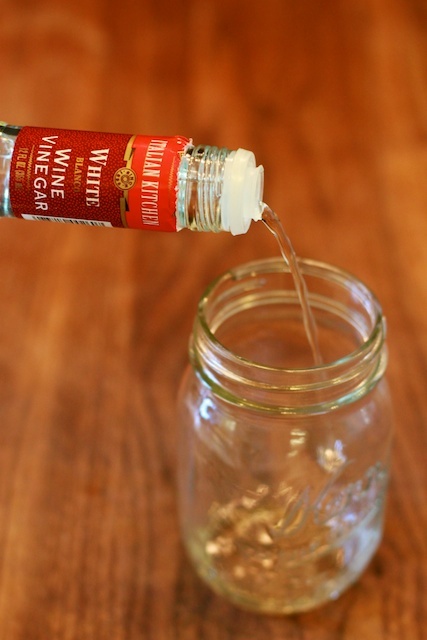 Pour in about 2/3 cup white wine vinegar (red wine will work too), and 1/3 cup olive oil. 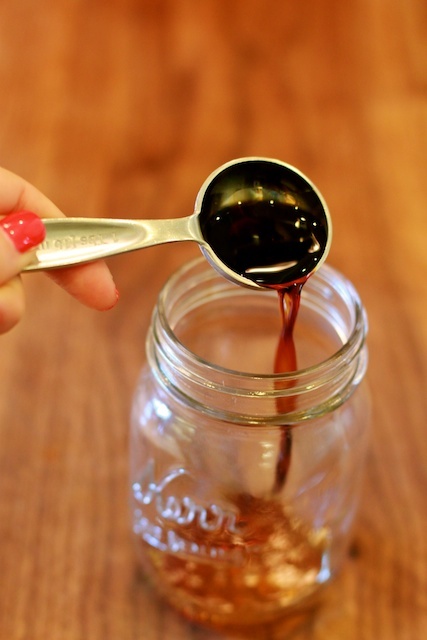 Add 2 teaspoons soy sauce and 1 tablespoon of agave. 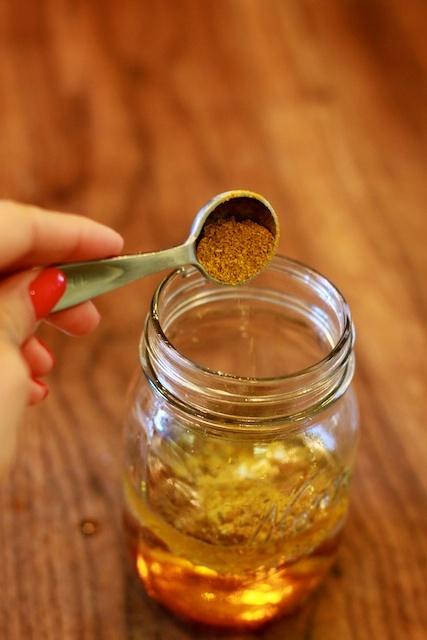 Next drop in 1 teaspoon of dry mustard, and 1/4 to 1 full teaspoon of curry powder. 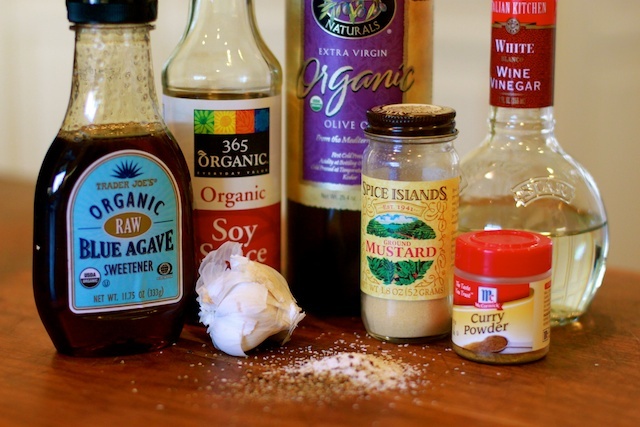 I would start with the minimum amount, then taste the finished dressing and add more curry powder if you like. 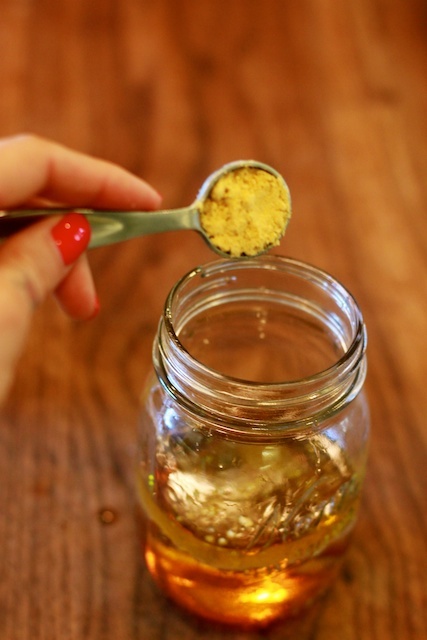 I personally add closer to a full teaspoon, but I like it spicy. You knew that. 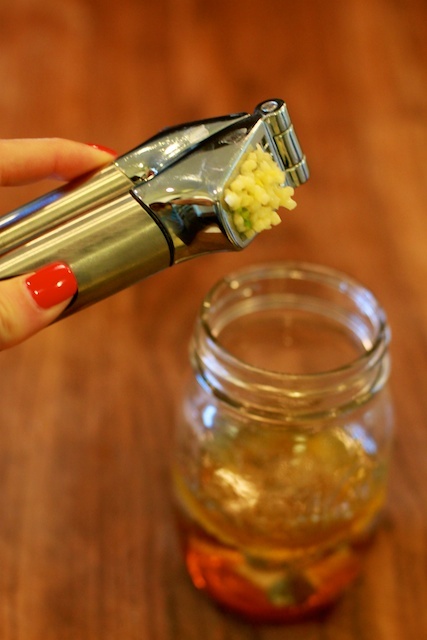 Add 1 clove of pressed garlic, some salt, and pepper, and voila! Dressing good enough to drink. Toss is all together and throw a party. Your friends will love you, and may in fact start camping out on your couch. But only if you add bacon. Don’t be like me. Give ’em what they want. 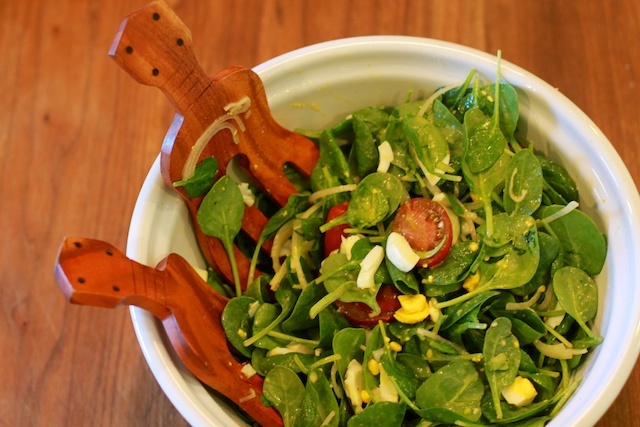 Now I know everyone and their mother has a fabulous version of spinach salad, yes? So here’s where we swap…I showed you mine, now you show me yours! 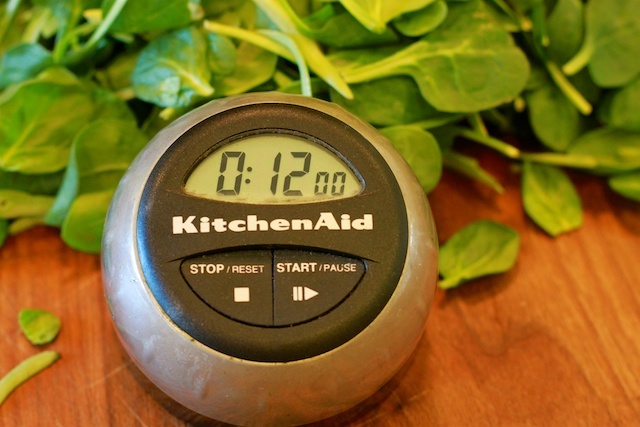 What snazzy secret ingredient do you top your salad with? 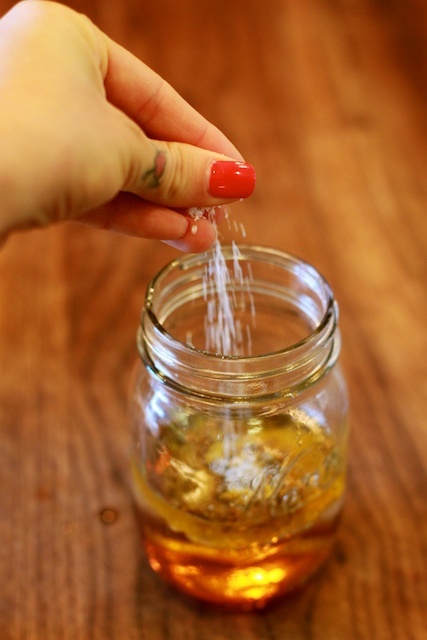 Have a dressing that’s sour as a dozen lemons? Gimme, gimme! I’d love to know what floats all your boats. 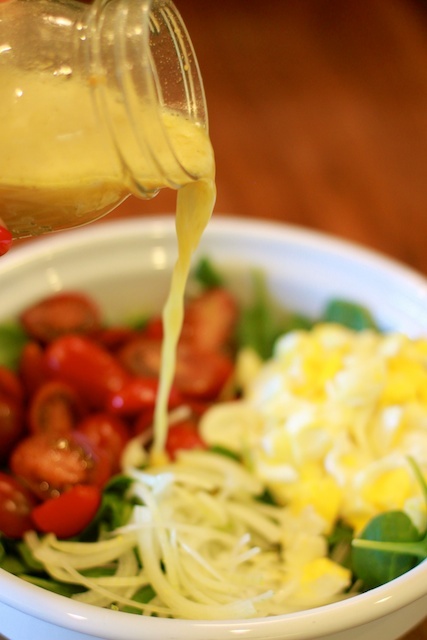 My mom makes a salad pretty similar to this one, but the dressing is altogether different. I like the way that your dressing looks better – but I won’t be telling my mother that anytime soon. Just because I’m currently single doesn’t mean I’m stupid when it comes to women, even if it’s your mom! 😉 Salad looks great! Oooh, there’s a store much like that in Coronado, CA that sells both flavored olive oil AND flavored vinegar. Shoot, you may have just inspired mt to take the 2 hour drive south! Great story! Thank you for sharing the wonderful recipe from Steve and his mom. 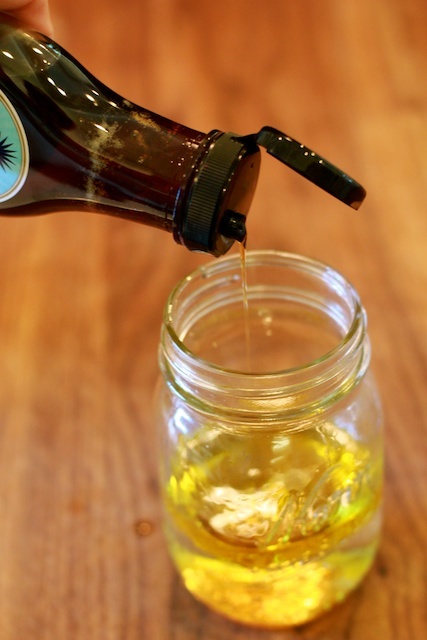 Ooohhhhhhh, super yummy, especially with a dressing like the one from the Asian kale salad! I am loving everything you post, Anjale! Beautiful photos, witty banter, and ideas for my next meal. WOW what a cool header for this one! You’re a pro. Hahah, learned from the best, baby! Yummmm! Sent hubs to the store for the ingredients! Yea! Have him pick up some sake!